It turns out there is a large body of evidence on how writing can improve reading. Three closely related instructional practices are continually effective when used to improve students’ reading comprehension. Graham & Hebert (2010) grouped these best practices in order of effectiveness. 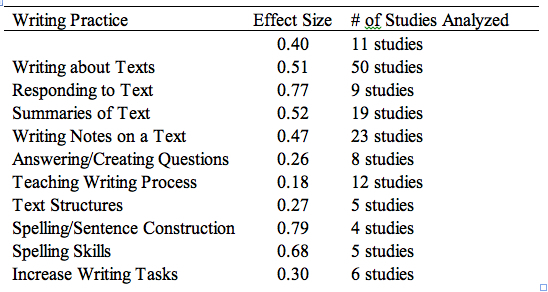 It should be noted that these effects were all positive and that social science researchers generally interpret effect sizes as small = .20; medium = .50; and large = .80. Have students write about the texts they read. (Student comprehension of social studies is improved when they write about what they read). Respond to a text in writing, perhaps by writing personal reactions, or by analyzing and interpreting texts. How do students apply the material that was read, or covered in class? What can be created from this passage? Write the Russian response to the Long Telegram. Make six points from this passage. Give me three reasons why? Extended writing has a strong and consistent positive impact on reading. Why did Kennan write the Long Telegram? Analytic essays: Describe three inventions that drove industrial growth during the 19th century. Provide reasons and/or examples for each choice. Write summaries of texts (six word memoirs/definitions, Collins 10% summaries). This technique has a stronger effect on elementary students than on middle and high school students. Write a short synopsis of the main and supporting information for each paragraph. Teachers need to explain each step, model the strategy, and allow students time to practice applying these new skills. Summarization of longer texts requires a skeleton outline, thesis, main idea subheadings each containing 2-3 important details. Later a student should convert the outline to a written summary of the entire text. Write notes about a text (paraphrasing, dual column close reading with primary sources). Consistently has a positive impact on reading comprehension. 15 minute history example. Divide class into 4 groups. Paragraph or sentence construction skills. (All of these improve reading comprehension). Reading comprehension is improved by increasing how often students produce their own texts. NWP (2003) study asked teachers to double the amount of writing they assign in class. It is essential to vary these techniques in order to keep students from falling into routines where they may become bored with note-taking and writing. Social Studies teachers have a larger burden than other content teachers when preparing writing tasks that help students understand what they read, as disciplinary reading within our field makes up the majority of a student’s academic vocabulary (See below). Cross-comparisons on the effects of different writing practices. Comparisons on different aspects of performance. How to bring writing practices to scale. Combining writing practices. Do more complex, multi-component practices yield stronger reading gains? Establish a greater range of writing about texts strategies. What are the long-term effects of writing and writing instruction on reading? Do students become better readers due to increased instruction in planning and revising? Graham, S., & Hebert, M. (2010). Writing to read: Evidence for how writing can improve reading: A report from Carnegie Corporation of New York. Carnegie Corporation of New York. Graham, S., Harris, K., & Hebert, M. (2011). Informing writing: The benefits of formative assessment. A Report from Carnegie Corporation of New York. Carnegie Corporation of New York. Great work, Scott. Thanks for sharing. 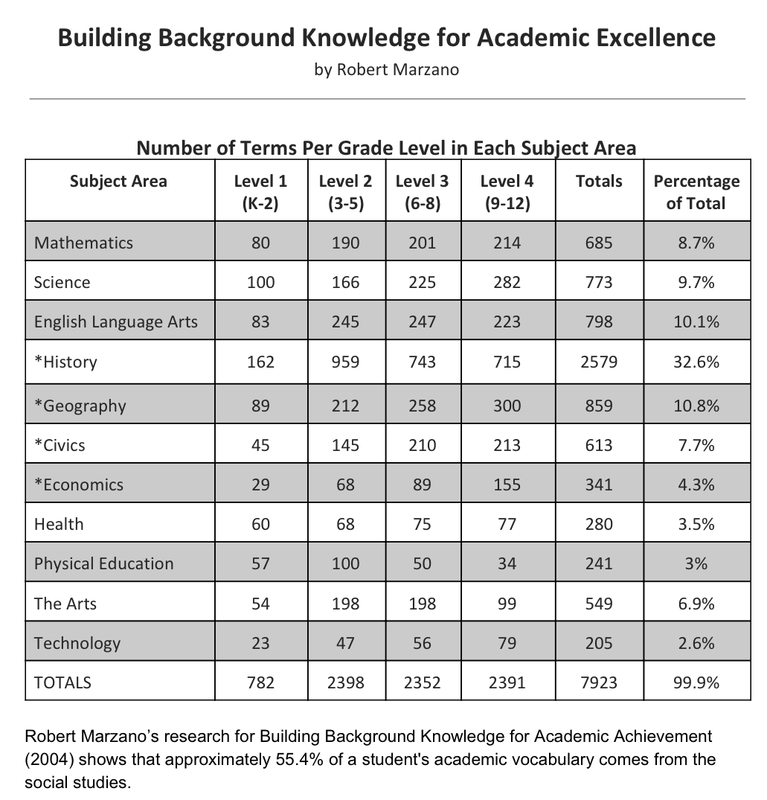 Marzano’s work showed that the effect size from note taking/summarizing was huge; analyzing similarities and differences more so. And you know that. I used to try to convince wannabe administrators that doing this kind of work in content and with context provided would produce those desired higher test scores. No go. Almost everyone thought that memorizing factlets was the way to go. Sigh. We keep trying. Keep up the good fight for more reading and writing!